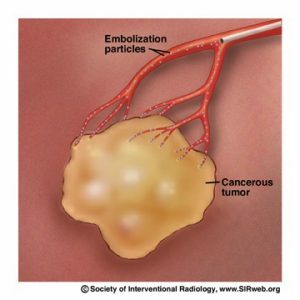 Chemoembolization therapy is used to treat liver tumors or for postsurgical adjunctive treatment. Chemotherapy medicines are injected into the liver arteries, delivering a high local dose of cancer-killing medicine directly to the tumor or tumor area. Another material called an embolic agent is also put into the liver’s blood vessels which cuts off the blood supply and essentially starves the tumor of the blood they need to survive and grow.